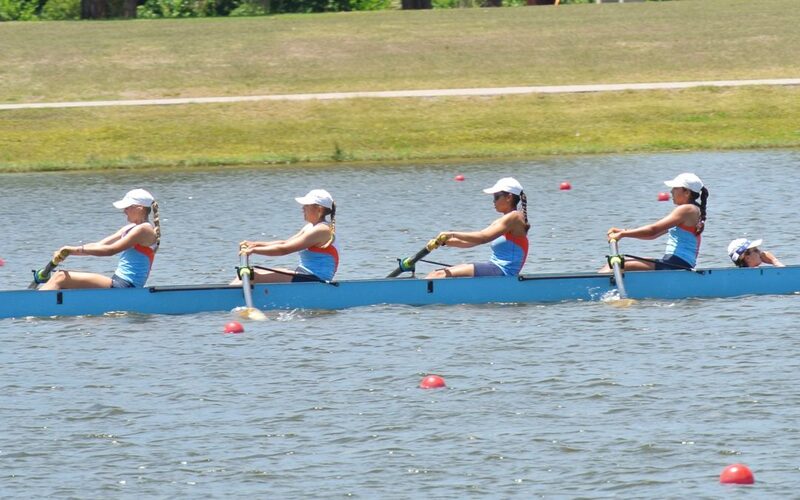 Our Junior 4+, consisting of Anna Schneider, Elizabeth Weis, Kennede Lewin-Occenad, Nina Catagena and Isabelle Gain earned a silver medal at the Florida State Championships today! The Junior category is restricted to athletes in 11th grade or lower. Anna, Elizabeth and Nina earned bronze in this event last year as sophomores and were determined to do better this year. With the help of Kennede and Isabelle, they did just that! They easily won their heat to advance directly to the Semi-Final. In the Semi, they again qualified easily for the Grand Final. In the Grand Final, they fought hard to get the gold but lost to a very fast crew. But, although gold was out of reach, they got silver by beating the rest of the crews by over nine seconds! We are very proud of these girls. They worked hard all year and their dedication paid off! We can’t wait to see what they have in store for their senior year!